Best Neoprene Seat Covers Reviews: Top-Rated 5 in April 2019! Which Neoprene Seat Covers Are a Good Choice? Neoprene rubber, also known as polychloroprene, was invented by scientists working for the DuPont company in 1931. Neoprene is made through the polymerization of chloroprene, and this end product is highly resistant to degradation that all other synthetics and natural rubber. Neoprene’s properties make it exceptional for marine uses, since it is chemical, oil, ozone and heat resistant. It is also an excellent elastic to metal bonding performance, making it perfect for multiple applications including the automotive industry. Neoprene is a thick material, so it does not breathe, as such it’s a perfect waterproofing solution and is what this product is found in many winter clothing products as well as being the only material of choice for diving suits. 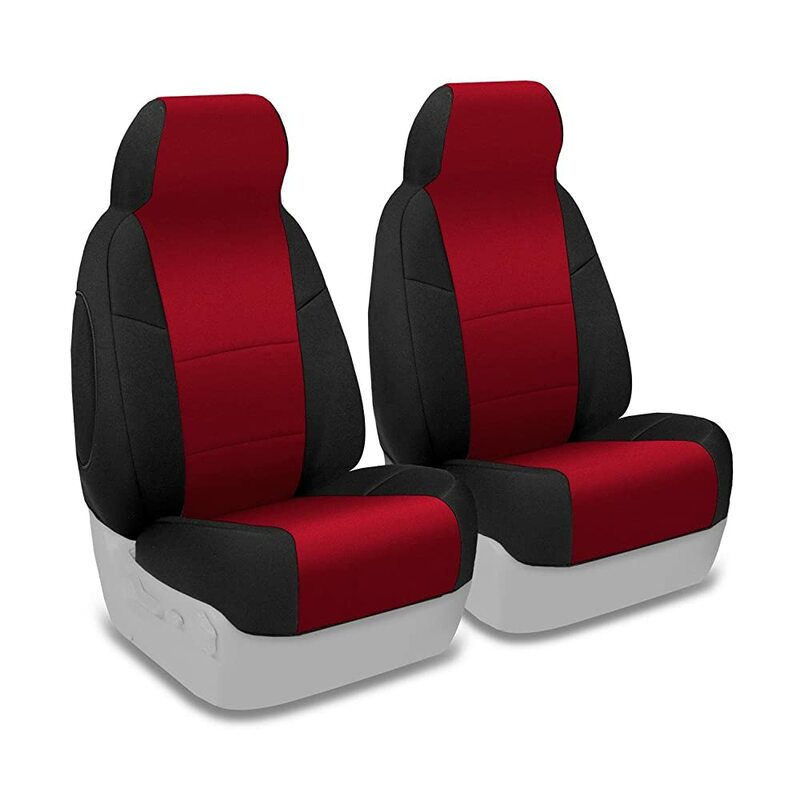 Since its such a great material to use, the automotive industry adopted Neoprene for many upholstery applications, and here are some of the best Neoprene seat covers and pet applications you will find on the market. Rough Country 91000 is a black neoprene seat cover for Jeep Wranglers and is a perfect waterproof solution as well as a dirt-resistant product that will keep both these covers and your original seat upholstery clean. Since it is neoprene, it is waterproof. The covers will fit over your vehicle’s seats like gloves to a hand, they are made to fit perfectly. The 4 layers are designed to perform specific tasks, and these include the thick foam padding that adds comfort to your ride, and the outer neoprene layer is waterproof, so any drink spillage or mud will just wipe away. The kit comes with a full set for the front and rear; this includes front seat covers, rear bench covers, and four full headrest covers. Fitment: 1997-2002, 4WD/2WD, Jeep, Wrangler TJ. You do not need any tools to install the covers, they just slip over the seats, and you fasten them with the built-in straps. 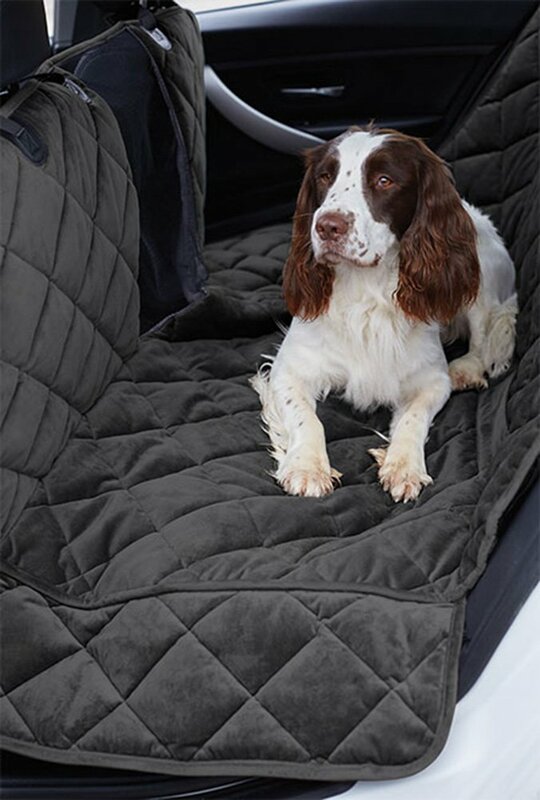 When it comes to pets, for both comfort and cleanliness nothing beats neoprene in any form. The Orvis pet hammock is not actually a seat cover as much as it covers the seating area, providing your pet with an in-vehicle hammock. Once the pet is in the hammock, it won’t be able to retread all over the seats, and this is especially good for rainy and muddy days. The hammock slips over the headrests frame and secures your pet in a higher location; this makes it better for you to see them, as well as provides them with a better view of the outside. The mesh provides both a better cooling air flow as well as a window for your pet to view from. The Smittybilt Jeep seat covers #471701 is made of 100% neoprene; this means you get the perfection of the performance of high-quality marine-grade materials with a design fitment for extra comfort. The design includes a slip-on installation with a padded center section. The front covers come with a back-side map pocket. 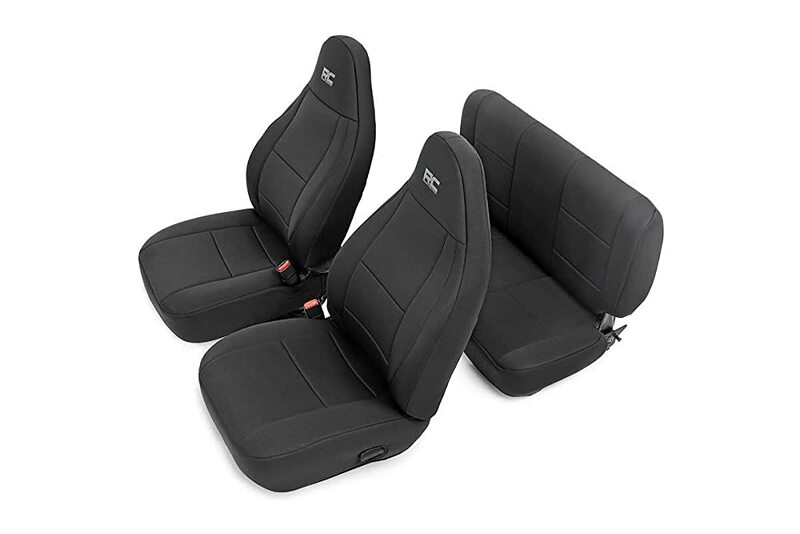 Since these seat covers are 100% neoprene, they are easy to clean and strong to survive for years. They will protect your Jeeps original upholstery from fading and from any wear and tear or staining. The Coverking Neoprene custom seat cover is made of extra thick Neoprene which provides a 100% waterproof solution. Since it is marine grade material, it also protects the seats of your car from wear, stains and UV rays. 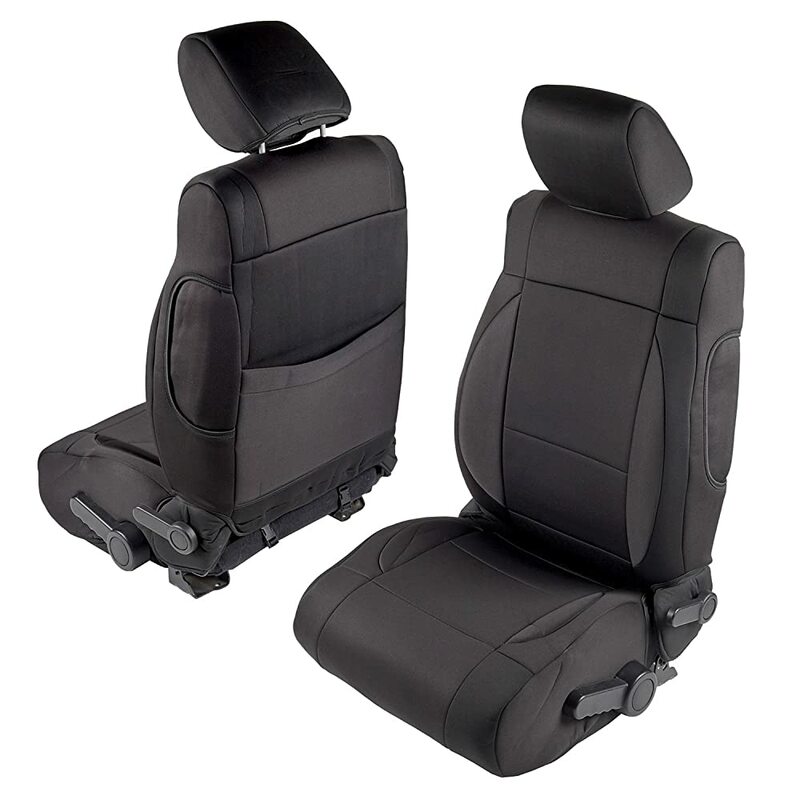 This model comes with a special comfort design that features extra thick foam padding, and the design features airbag cutouts, map pockets and headrest, and armrest solutions. The fabricated easy to install design features only two simple but effective layers, the base Neoprene layer that is fully waterproof and the external Neotex layer for comfort. This model comes in a number of colors and patterns, so you are not limited to just one design feature. 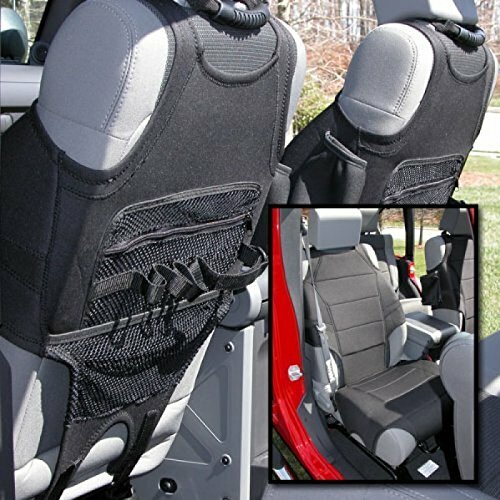 The Rugged Ridge 13235.20 is an all Neoprene jeep seat cover that comes in a streamlined black with extra foam padding. This extremely comfortable design slips over your seats in seconds and comes with additional features for extra performance. These seat covers come with an amazing mesh array at the back of the front covers, which is great multiple and tactical for storage usage. The design of these covers is not conventional; they are more of a tactical seat cover than a standard comfort ride cover. As such, if you use your jeep for work, this is the best seat cover you could ask for. Neoprene is waterproof and is used as a diving suit material, cleaning it is simple and easy. Select cold and gentle wash.
After the cycle is completely remove the covers and hand them out to dry in the air.